Monday, June 29th was a big day on both the Comox Valley and Campbell River Hospital construction sites. 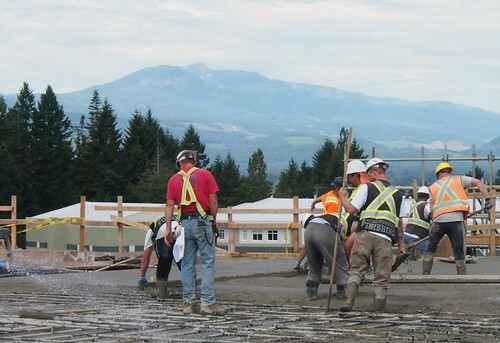 At the Comox Valley Hospital site in Courtenay, crews began pouring the first concrete for floor Level 5. They’re seen here with Mt. Washington and the roof of Queneesh Elementary School in the background. 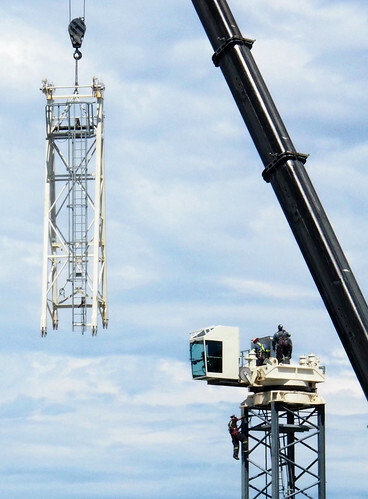 In Campbell River, Tower Crane 2, erected on the south end of the construction site last December, has completed its job. Monday, June 29th saw a crew of high riggers working with a huge mobile crane to take down the 50-metre tower crane, segment by segment. In this picture the riggers work on the ‘turntable’ section while the tower crane’s top segment is lowered to the ground.